Beautiful and professionalI can't say enough about my save the date magnets, the process for ordering and designing was very easy and user-friendly. The magnets came quickly and surpassed my expectations! The pictures are clear and focused and the magnet is sturdy but not too thick. I am so glad I saved time by having my addresses printed for free on the envelopes. I had a wonderful experience with New and Blue and would recommend. 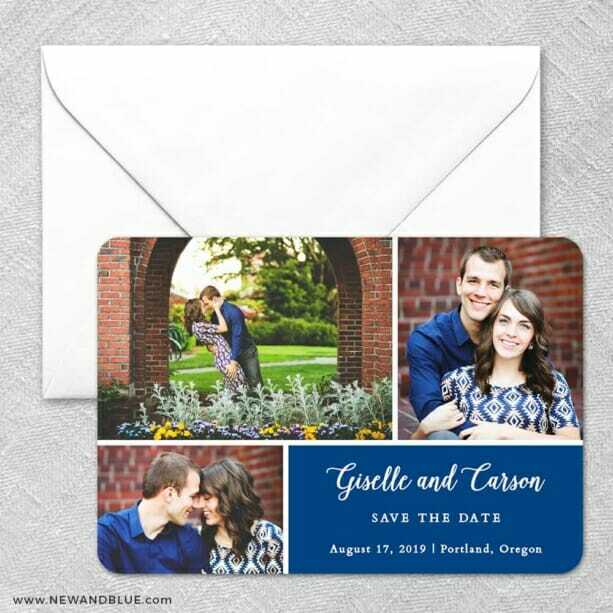 Beautiful and Amazing Customer Service!We ordered the trio magnet design for our Save the Dates as we could not decide on just one photo to use. Minutes after clicking "place order" I realized that I forgot to include our wedding website on the design. My fiance called their office right away and left a message (it was Sunday evening after business hours), and a representative called him back first thing the next morning. They were so helpful and accommodating to make the change to the design before processing the order. The magnets came very quickly and were exactly as they looked in the proof online. The thickness of the magnet is very nice (definitely not flimsy) and the quality of the photos are perfect. I would absolutely recommend that you order through New and Blue!